1997 Haas VF-6 4-Axis CNC Vertical Machining Center s/n 12246 w/ Haas Controls, 20-Station ATC, 50-Taper Spindle, 5000 RPM, 30Hp Motor, Thru Spindle Coolant, Rigid Tapping, Programmable Coolant Spigot, Brush “A” Axis, Sigma Motors X-Y- Z, 2:1 Encoder Pulley, 1mb Extended Memory, Quick Code, Rigid Tapping, Hand Wheel, 28” x 64” Table, Coolant. 1999 Haas VF-3 CNC Vertical Machining Center s/n 17519 w/ Haas Controls,20-Station ATC, CAT-40 Taper Spindle, 20Hp Vector Drive, 7500 RPM, Brushless Servos, 1mb Expanded Memory, Rigid Tapping, Programmable Coolant Spigot, Floppy Disc, Chip Auger, 18” x 48” Table, Coolant. 1998 Haas VF-2 4-Axis CNC Vertical Machining Center s/n 16408 w/ Haas Controls, 21-Station ATC, CAT-40 Taper Spindle, 20Hp Vector Drive, 7500 RPM, Programmable Coolant Spigot, 1mb Extended Memory, Quick Code, Macro Cade, Rigid Tapping, Hand Wheel, Chip Auger, Floppy Disc, Chip Auger, Coolant. 1996 Dahlih DL-MCV1500 4-Axis CNC Vertical Machining Center s/n 1350593 w/ Fanuc Series 0M Controls, 24-Station ATC, BT-50 Taper Spindle, 3500 RPM, Hand Wheel, 12” 4 th Axis Rotary Head, 26 ½” x 67” Table, Coolant. 1996 Amura Seiki DL-MCV1500 CNC Vertical Machining Center s/n 1350530 w/ Fanuc Series 0M Controls, 24-Station ATC, BT-50 Taper Spindle, Chip Auger, 26 ½” x 67” Table, Coolant. Kafo / Amura VMC-2185 CNC Vertical Machining Center s/n 24006 w/ Fanuc Series 15-M Controls, 32- Station ATC, CAT-50 Taper Spindle, 33 ½” x 82 ½” Table, Coolant. 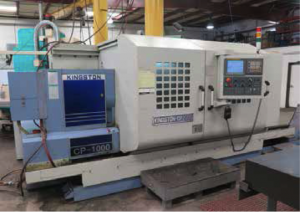 2011 Kingston CP-1000 CNC Flat Bed Lathe s/n 10P980417C w/ Fanuc Series 0i-TB Controls, 7” Thru Spindle Bore, 30hp Motor, 7-750 RPM, 4-Position Indexing Tool Post, Tailstock, 24 ¾” 4-Jaw Chuck, (2) Chip Conveyors, Coolant. Mori Seiki LL-7 44” x 148” CNC Flat Bed Lathe w/ Fanuc System 6T Controls, 8 ½” Thru Spindle Bore, 44” Swing @ Gap, (2) 4-Position Indexable Tool Posts, Tailstock, (2) 28” 4-Jaw Chucks, Chip Conveyor, Coolant. Hitachi Seiki 4NE II-600 CNC Turning Center s/n 41880 w/ General Numeric GN-6 Controls, 12-Station Turret, Hydraulic Tailstock, 16” 4-Jaw Chuck, Coolant. Acra AM-5SAC Vertical Power Mill s/n 010472 w/ Acra Controls, Newall Topaz Programmable DRO, 5Hp Motor, 60-4500 Dial Change RPM, Chrome Box Ways, Power Feeds, Power Knee, R8 Spindle, 12 ½” x 58” Table, Coolant. Acra AM-5SAC Vertical Power Mill s/n 010361 w/ Acra Controls, Newall Topaz Programmable DRO, 5Hp Motor, 60-4500 Dial Change RPM, Chrome Box Ways, Power Feeds, Power Knee, R8 Spindle, 12 ½” x 58” Table, Coolant. Acra AM-5V Vertical Power Mill s/n 000438 w/ Acra Controls, Newall Topaz Programmable DRO, 5Hp Motor, 60-4500 Dial Change RPM, Chrome Box Ways, Power Feeds, Power Knee, R8 Spindle, 12 ½” x 58” Table, Coolant. DeVlieg “Spiramatic Jigmil” mdl. 3B-48 Horizontal Boring Mill s/n 3-187 w/ DeVlieg Controls, Acu-Rite III 3-Axis Programmable DRO, 25-1200 RPM, 3” Spindle, 40-Taper Spindle, Power Feeds, 30” x 48” Table. DeVlieg “Jids, 30” x 48” Table. LeBlond 25” 31” x 52” Geared Head Lathe s/n NI 1225 w/ Mitutoyo DRO, 6-560 RPM, Inch Threading, Tailstock, 21” 4-Jaw Chuck, Coolant. Sairyo 1743 17” x 43” Geared Head Gap Bed Lathe s/n CH89363 w/ 35-2000 RPM, Inch/mm Threading, Tailstock, 5C Collet Closer, 10” 3-Jaw and 4-Jaw Chucks, KDK Tool Post, Coolant. Hansvedt Cintrojet SM-18E Die Sinker EDM Machine s/n J07102 w/ Hansvedt Controls, Hi- Pulse EDM Power Source, 26” x 41” Table, 14” x 10” Ram Area, Coolant. Ikeda Type RM-1300 13” x 42” Radial Arm Drill s/n 72240 w/ 13-1440 RPM, Power Column and Feeds, 18” x 21 ½” x 12” Tooling Block, Coolant. 80-Ton Hydraulic H-Frame Press w/ 7 ½” Ram. DoAll mdl. ML 16” Vertical Band Saw w/ Blade Welder. Wilton mdl. 7010 9” Horizontal Band Saw s/n 805204 w/ Manual Clamping, Coolant. CK Electric Kiln w/ 3-Heat Zones. Joy Twistair mdl. 7A-020-TAN4G 20Hp Rotary Vane Air Compressor s/n 137428 w/ 120 Gallon Tank. 5Hp 2-Stage Back-Up Air Compressor. Sand Blasting Booth w/ Lazy-Susan Table, Kelco Sand Blasting Pot. Cyclone “Flip-Top” Dry Blast Cabinet w/ Dust Collector. (2) 4” Precision Machinists Vises. 5” Angle-Lock Vise.T (2) 4” Precision Machinists Vises. Troyke 15” x 15” Rotary Cross Slide. (3) Dumore Tool Post Grinders. 6” x 6” Sine Table. Mitutoyo 16”-24”, 12”-16”, 06”-12” OD Mics. Draper 24” Vernier Height Gage. 48” x 72” x 8” Granite Surface Plate w/ Stand. Standridge 24” x 36” x 4” Granite Surface Plate w/ Cabinet Base. Starrett Crystal Pink 18” x 24” x 6” 2-Ledge Granite Surface Plate.